Scientists know what the universe looked like when it was a baby. They know what it looks like today. What they don’t know is how it looked in its youth. Thanks to technological advances, however, scientists hope to complete the photo album and provide a picture of how the cosmos developed into the kind of place that could support life like that found on Earth. They plan to gather these never-before-obtained insights with a potentially “game-changing” instrument that is expected to be 10,000 times more sensitive than the current state-of-the-art. The instrument is being designed to gather data of objects so distant from Earth that they no longer can be observed in visible light, only in the infrared bands of the electromagnetic spectrum. In particular, this instrument, called a spectrometer, will measure the properties of the infrared light to identify the object’s composition and other physical properties. Just as impressive, the aptly named MicroSpec would be able to perform these highly sensitive observations from a very small platform — so small, in fact, that all its components would fit onto a silicon wafer measuring just four inches in diameter. Although the technology could help answer a plethora of science questions, it is ideally suited for studying the evolution of the universe and by extension, humanity’s place in it. Past NASA missions, including the Goddard-developed Cosmic Background Explorer and the Wilkinson Microwave Anistropy Probe, studied the infant universe. They gathered information about the primordial light created during the universe’s creation. Both detected tiny temperature differences, which pointed to density differences that ultimately gave rise to the first stars and galaxies formed 400,000 million years after the Big Bang. However, scientists have yet to study these objects with great precision. They also have not studied light emitted by the life-sustaining elements created in these first stars and later distributed across the universe in stellar explosions. By building an instrument like MicroSpec, and studying this specific era in the universe’s nearly 14-billion-year history, scientists will “get a very clear picture of how the universe developed into the kind of place that could support life like us,” Moseley added. 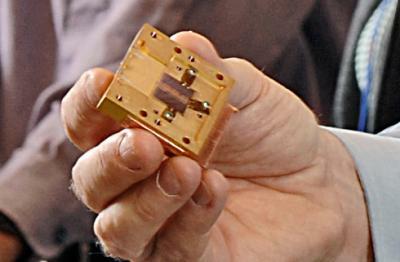 In essence, Moseley, Hsieh, and their NASA Jet Propulsion Laboratory and CalTech University collaborators have found a way to dramatically shrink the size of the instrument. Compared with traditional spectrometers, which typically are table sized, the entire MicroSpec package of components, including its detectors, optics, and filters, would all be arranged on a thin silicon wafer measuring about 400 microns in thickness — four times the width of a human hair — and four inches in diameter. “The idea was to get everything closely integrated and you get devices that are higher performing,” said Carl Stahle, a Goddard technologist and the new business lead for the Instrument Systems and Technology Division at Goddard. And because the components are assembled on silicon, MicroSpec can be mass-produced, just like the silicon chips used in computers and other electronic equipment. Therefore, NASA could produce multiple devices and assemble them as one compact instrument. In addition to providing increased sensitivity, MicroSpec would reduce the amount of time to observe objects in the sky because more light-detection capabilities would be built into the instrument. “The key is understanding what you can do on the silicon wafer. That’s your instrument on a chip,” Stahle explained. Also contributing to MicroSpec’s increased sensitivity — estimated to be 10,000 times better than current state-of-the-art instruments — is the degree to which it would be cooled. To detect far infrared light, instruments must be cooled to frigid temperatures to prevent instrument-generated heat from swamping the faint infrared signal. Therefore, the colder the instrument, the better the signal it receives. Moseley and team plan to employ an advanced Goddard-developed cooling system that would chill MicroSpec to just a tenth of a degree above absolute zero (-459.67 degrees Fahrenheit).